It’s hard to imagine modern cooking without garlic. It’s a base ingredient in so many different dishes of all types of cuisines, thanks to it’s ability to make even the most boring dish taste amazing. Thankfully, garlic benefits our health in so many different ways as well. Garlic is one of those natural remedies that has long been prized for both its culinary and medical properties, and was widely used in ancient cultures across Egypt, China and India. Most of the culinary and medicinal properties of garlic are a courtesy of the sulfur compounds it contains. These compounds are released only when the garlic clove is chewed, crushed or cut. Another powerful compound in garlic is allicin. This biochemical is responsible for the distinctive smell of garlic. It has excellent antibacterial, antifungal and antiviral properties. Let’s take a look at the amazing garlic benefits you can enjoy if you add a little bit more of it into your diet. Acne occurs due to excessively oily skin and debris being accumulated in your hair follicles. This debris consists of dead skin cells, which are held together by the oil inherently present in the skin surface. Garlic benefits your skin and is also an old treatment for acne. Allicin is a potent antibacterial and antifungal agent. It takes care of the bacterial infestation in the hair follicles and helps in relieving any bothersome acne symptoms. Allicin also exhibits anti-oxidation properties that help in limiting the damage caused by the free radicals to the skin, thereby reducing the load of the dead skin cells. 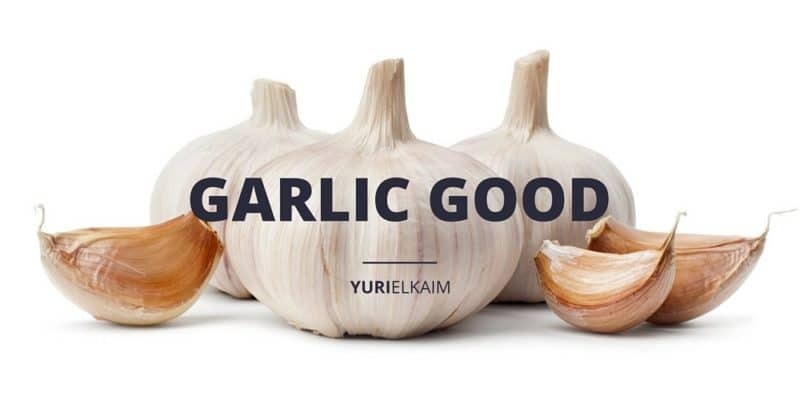 Moreover, one of the benefits of garlic is that it has anti-inflammatory properties which help to resolve the erythema and swelling around the acne lesions, thereby markedly reducing the pain associated with this unsightly condition. Here’s how to make it work for you: take two to three garlic cloves, crush them and place them in a cup of water. Let the crushed garlic soak for 10 to 15 minutes. After that, dip a cotton ball in the solution and gently dab it onto the affected parts of the skin. Let the liquid dry and then rinse off after 20 minutes. Apply twice a day. When cold season rolls around, you start hearing echoes of coughs and sneezes everywhere you go. It’s a bit like when the music from Jaws starts playing… you know trouble is coming. Most adults come down with the cold twice a year. The usual treatment consists of treating the symptoms with antipyretics and antihistamines, and sometimes even broad spectrum antibiotics. Nasal decongestants are also pretty popular. What if you didn’t have to reach for the medication? As I mentioned earlier, garlic has antibacterial and antiviral properties. It’s been used since time immemorial to treat a common cold. Psoriasis is another unsightly skin condition and is usually a lifelong affliction. It occurs because of an excessive reaction of arachidonic acid in the fat tissue of the body, resulting in a flare up of inflammatory. This inflammation cascade is started off by an enzyme called lipoxygenase. Thankfully, garlic has a significant lipoxygenase inhibiting activity which nips the inflammatory process at its very initial stages. In addition, garlic delivers a strong dose of antioxidants because of the presence of zinc and selenium in addition to allicin. Garlic can play an important role in a fat-burning diet thanks to its fat burning properties. It regulates the blood glucose levels by harmonizing the action of insulin, thereby helping your body burn fat as an energy source. Garlic also acts as a potent diuretic. Nobody wants high cholesterol. Once your levels are elevated, you become a likely candidate for heart disease, one of the leading causes of death all over the world. There are numerous types of medicines in the market that claim to control your cholesterol levels, but you can attack it through natural means as well. This effect extends to low-density lipoproteins, which, if high, are not considered conducive to good cardiovascular health. Low-density lipoproteins are reduced by consumption of garlic. HDL (high-density lipoprotein) is slightly raised by garlic consumption, which again is good for the health of an individual. Alzheimer’s is caused by deposits in the brain of a protein called amyloid beta protein peptide. This forms a plaque which interferes with the normal functioning of the brain, resulting in various types of disabilities. Medical treatment for Alzheimer’s is extremely expensive, and due to this, there is a growing interest in natural means of staving off the disease. One of the potential solutions gaining traction is garlic. What has been extensively tested is something called aged garlic extract. It contains a substance called S-allyl-L-Cysteine, which has a protective effect on the brain from the changes occurring due to the inflammatory processes of the disease. In a four-month study on mice, the use of aged garlic extract brought down the amount of plaque in the brains of the tested mice. These are just a few of the many ways garlic benefits your health. You can work more of it into your diet by taking garlic supplements, dicing or grating it onto salads, or simply cooking it with it more often. You can even take it raw. However you choose to get more garlic in your life, go for it! If you enjoyed this article on the Amazing Benefits of Garlic, you might also like my Home Remedy Handbook. Get 10 of my safest and most effective home remedies – for FREE – by clicking the banner below.